I’m going to show you just how easy it is to make homemade taco seasoning and how to stop spending unnecessary money on those store-bought packets. Chop the grocery budget by creating homemade versions of your favourite products. Comparing the flavour of packaged taco seasoning vs. homemade taco seasoning you will easily tell the difference and I’m betting you’ll be just as if not more than satisfied making it yourself. This is not a copycat Old El Paso taco seasoning it’s a new-age vibrant taco seasoning mix that will make all of your Mexican dishes sing, ole! I’m guessing since you’re reading this recipe that you likely have a nicely stocked spice pantry in your house. In our house we have our spices set up in medium-sized mason jars which are labelled for easy reach. Having a well-stocked pantry will not only contribute to grocery savings but you don’t have to rush out every time you are short of a product. My wife and I are both huge Mexican food lovers and we love our spices. I’m not talking about hot spices either because I’m not a huge fan of “Heat”. I don’t mind hot from the oven or stove food but not spicy food that begs you to drink from the milk jug. Today my homemade taco seasoning mix is a trial and error success for us as we’ve experimented over the years with flavours that we believe make up the best homemade taco seasoning around. When we used to buy those taco seasoning packets at the grocery store we would spend anywhere from $1.00-$1.39 each. Most often if you read the label on the taco seasoning you will notice that there are some funky ingredients in the packet besides taco seasoning spices. You may also find that taco seasoning in the packets have a high sodium count although there are reduced sodium taco seasoning packs you can buy. You won’t be buying packets spending your hard-earned cash on taco seasoning when you can make a mason jar full that will last you for ages. The cost to you will likely be the same price you pay for a 28g packet of taco seasoning at the grocery store. It’s not just about the price though, flavour is very important. When I created my latest jar of homemade taco seasoning for this recipe I tripled the recipe just to see how much it would take to fill a small mason jar. I wasn’t far off but remember you don’t want too much of the homemade taco seasoning hanging around if you don’t use it on a regular basis. Spices don’t hold their flavours for too long so always make sure you have the freshest spices in your cabinet for optimal homemade taco seasoning flavours. When we make homemade guacamole we add homemade taco seasoning to give the avocado tonnes of flavour. 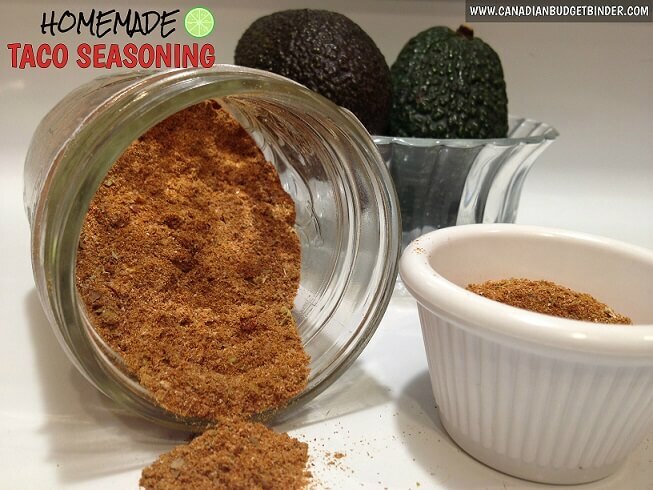 In the past we’ve just used cumin but this homemade taco seasoning is so versatile that you can use it to season many dishes. There are a couple of hot spices like red chili flakes and chili powder in this homemade taco seasoning but have no fear it’s not a hot taco spice mix. Keep in mind you can regulate how much heat you add to your homemade taco seasoning. That’s another great part of making taco seasoning at home. You can always add or take-away spices that you don’t care for. The taco seasoning ingredients that I chose to use may have a touch of heat but to balance that I added in my secret weapon…cinnamon. That’s right you will need cinnamon for this homemade taco season but trust me when I say it works very well in any recipe that requires Mexican spice. What spices do you add to your homemade taco seasoning and are there any other spice mixes you create at home? If yes, I want to hear about it. Leave me a comment below. The recipe below is enough for one or two meals. For the cover photo I tripled this recipe and it almost gave me a full small mason jar full. The best place to buy your spices are at an Indian or Chinese market because cooking with lots of spices is their signature and they are cheap to buy. You can also order spices online at Spices for Less if you don’t want to leave home or you’d rather have someone else do the leg-work for you. Making homemade taco seasoning will brighten your day because you know every ingredient that will go into making your food delicious. Mix it all together and store in an air-tight mason jar or other container for up to 3 months. Mr CBB, thanks for sharing the recipe of Taco seasoning as I love Tacos especially if it is spicy and beef tacos. Now, I don’t have to buy seasoning from the grocery. Thanks! Yummy! Thanks for sharing these ideas Mr. CBB! I need to look into making a few of my own mixes. From all the different jars I found the “Porter Spice Rack Chromewire” one to look best for quality and design. It’s currently at 25$, but they should have a sale going on soon again. I have the rack on my countertop since the chrome looks nice enough with my other appliances, though I am sure it could also fit in a cupboard. Lastly: they come with clear labels for the top of the lids. So there is no twisting and turning to find the right jar. Mr. CBB, just a tip I learned about what to do with old spices…I was in a nice Indian spice & cooking store a while back looking for a unique spice & got talking with the store owner. I must’ve mentioned having to toss some old spices because he looked at me alarmed & said there’s never any reason to throw out old dried spices. He said to simply toss them in a skillet or frying pan over low heat & keep tossing them around to prevent burning until they become fragrant again (makes the kitchen smell wonderful!). Then they are ready to use again! I’ve tried that trick since then & have been thrilled with how well it works–especially for things like curry powder & dried oregano & rosemary which is about all I’ve tried it with so far. I thought that tip alone was worth my trip into that store! I have been thinking about making up some spice mixes for here but taco seasoning is not high on that list as hubby doesn’t like them so we don’t make them often. This is where the kits are handy as I am not left with stuff left over to go nasty. The salsa is the usual culprit there and with his compromised immune system I won’t take the chance with it sitting in the fridge for long. That said it does look interesting and I just might make it at some point. I’ll have to see what I can sneak it into here. It’s good that it isn’t hot spicy as the. It’s and I are not big on that either. Hubby used to love that stuff but things have changed there. I like the idea of the little jars for spices, I need to clean out that cupboard so I will be looking for a deal on those little jars to use for spices!!! Try using the mason jars. You can probably find them very cheap at a second-hand shop.